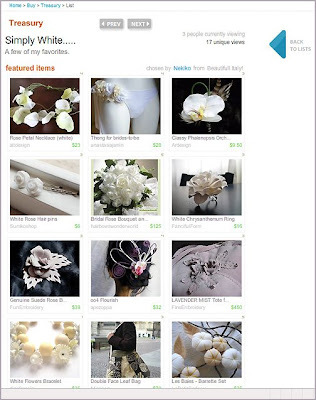 hairbowswonderworld: WEDDING TREASURIES ON ETSY! I am so chuffed my bridal bouquets've been featured in two Etsy treasuries since today. So if you feel them treasuries are so pretty as I do, give it a few clicks to see better what inside, especially with the GREEN WEDDING TREASURY you will get to see fabulous items of my fellow crafters of the ETSY WEDDING TEAM , please click on every single item aseverything is beautiful! 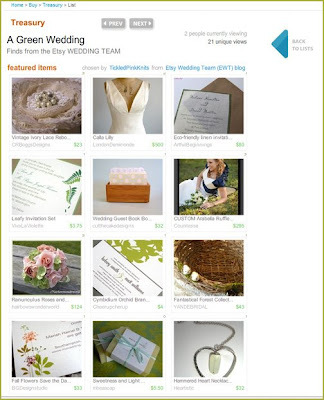 Who know your clicks mightbring it to Etsy front page! It's ashamed if precious treasuries remain hidden (as usual LOL). I would like to say big big thank you to TickledPinkKnits and Nekiko for making elegant treasuries with such a good taste. Why don't you click on the links above to visit their wonderful shops? Nekiko offers cute and fun jewellery and TickledPinkKnit sells her unreal, gorgeous knitwears and accessories. I am sure you will be thrilled! I am stopping by all my followers blogs to say hi. I am having a giveaway on my blog if you would like to enter.